The National Football League (NFL) Pro Bowl returned to Camping World Stadium in downtown Orlando on Sunday, Jan. 27, 2019. This is the third year that the stadium has hosted the battle on the gridiron between the American Football Conference and the National Football Conference in a matchup of skills from the best all-star players in the league. To kick off Pro Bowl Week, the NFL hosted their Community Legacy Event at Ivey Lane Park in Orange County. Volunteers from nearby schools along with NFL Legend Captains Emmitt Smith, DeMarcus Ware and Brian Urlacher planted park-friendly landscaping, built a neighborhood vegetable garden and revitalized an interactive play area at the park. 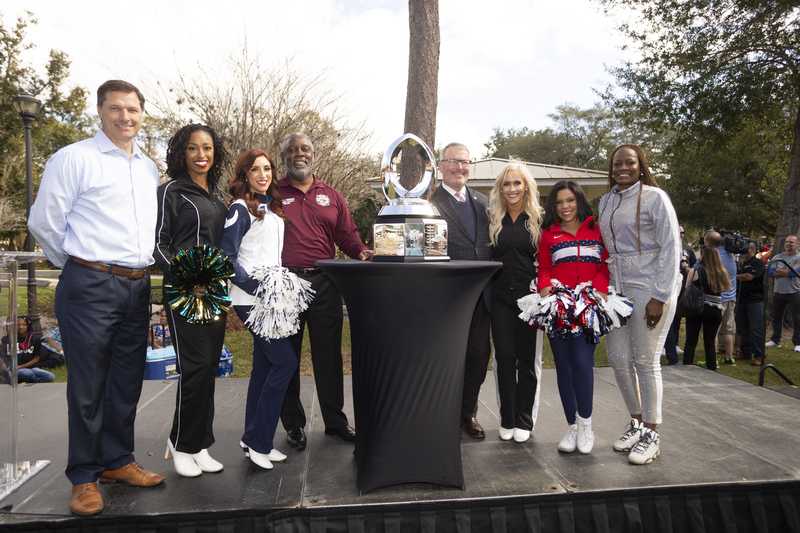 Orange County Mayor Jerry L. Demings, alongside other elected officials and business leaders, visited Ivey Lane Park to help kick off Pro Bowl Week and greet volunteers. The park revitalization project is part of the NFL’s Green Initiative, a focus on environmental efforts and responsible stewardship to the communities that they visit. Leading up to game day, Pro Bowl Week celebrates the host community. The NFL has planned additional events around the region intended to create a positive impact in areas including community service, youth football, youth health and wellness, military families and sustainability efforts. Furthermore, Pro Bowl Week engages fans through all levels of football, from youth to high school, giving them the opportunity to watch their favorite players during Pro Bowl practices and skill drills, as well as participate in exclusive clinics and family-friendly fan zones. Photo Caption: Orange County Mayor Jerry L. Demings, alongside local elected officials and business leaders, gathered at Ivey Lane Park in Orange County to kick off Pro Bowl Week and greet volunteers during an NFL community revitalization project.